This page lists concerts for the Inland Empire by date. To find information for a particular day, click on a date on the calendar below, or continue scrolling down the page. Clicking a date on the calendar on the home page will take you to Concerts by Date for all cities. Please remember that although every attempt is made to bring you the most current concert information, all schedules are subject to change. It is recommended that you confirm any performance you wish to attend. Concerts are listed by all cities together, or separately for Los Angeles County, Orange County and the Inland Empire. For a list of concerts in cities for one county only, click the appropriate link in the column on the left. Enjoy the summer! In the introduction to this summer's site theme, it was said that the site this year is a tribute to comics, anime, graphic novels, manga and the like. But what exactly is anime? 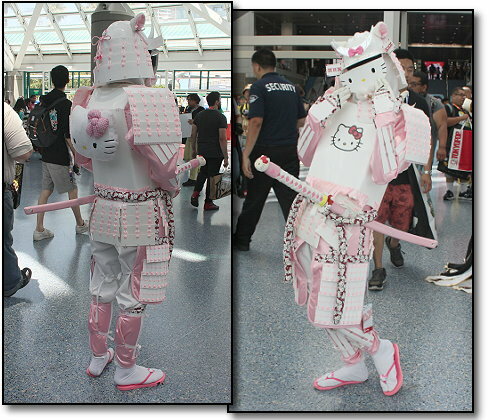 In the United States, the word "anime" generally is used to refer to a form of cartoon-like art developed in Japan. The word is a shortened version of the Japanese word used to identify all animated productions developed in Japan. For those interested, a good explanation of "anime" as an art form, and characteristics distinguishing it from cartoons, can be found at www.animeartmuseum.org/whatisanimeart. 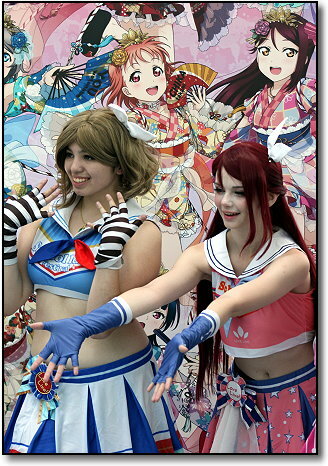 Earlier this month, an event which its organizers refer to as "the largest celebration of Japanese pop culture in America" was held at the Los Angeles Convention Center. 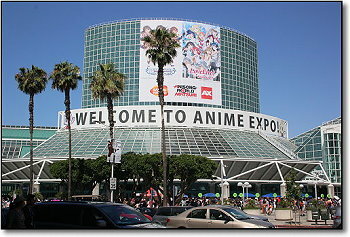 The Anime Expo (www.anime-expo.org) was held July 4 - 8, and the event was organized by the Society for the Promotion of Japanese Animation (SPJA, www.spja.org). In a news release the SPJA said the event drew 110,000 people from over 70 countries, with an accumulated turnstile over the few days of 350,000. 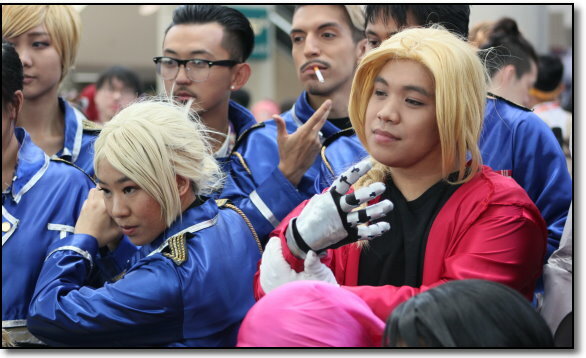 The event included entertainment, music, fashion, video games, artists, cosplay and much more. 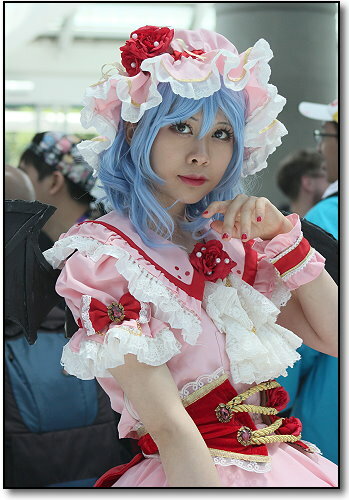 Cosplay is a word short for costume play, and many expo attendees dressed up as their favorite anime characters. 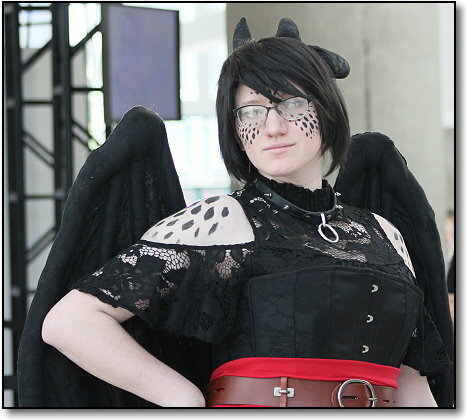 Once inside the convention center doors, the main hall served as an area where many gathered to show off their costumes and pose for pictures. 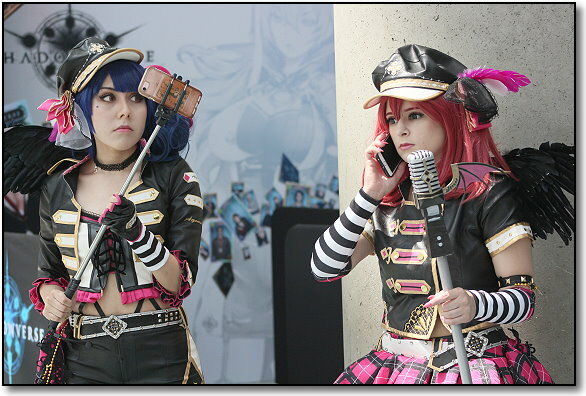 The photographs on all the "Concert By Date" county pages are examples of some of the fan costumes seen at the expo plus miscellaneous scenes from the event. 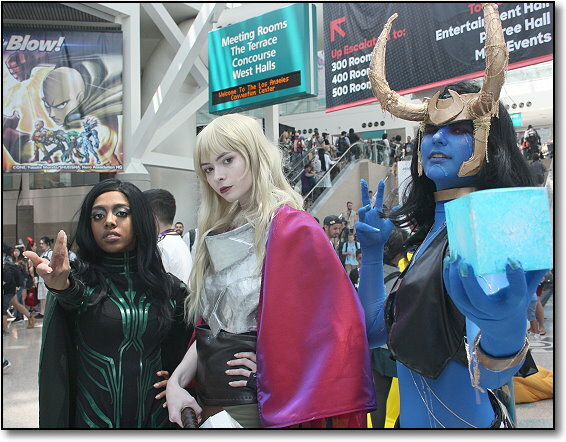 The video below is from a KCAL 9 news broadcast about the Anime Expo. There are no performances scheduled on this date. EASTVALE - EASTVALE "65TH STREET LIVE!" CONCERTS. Mirage (Fleetwood Mac Tribute). Concerts are from 7:30 - 9 p.m. at Harada Heritage Park, 3099 65th Street. There will be food available for purchase, and bring blankets or beach chairs. Information: (951) 727-3524, www.parks.jcsd.us or www.eastvaleca.gov. LAKE ARROWHEAD - LAKE ARROWHEAD VILLAGE SUMMER CONCERT SERIES. Styx Experience (Styx Tribute). All performances (unless otherwise noted) take place from 6:30 - 8:30 p.m. at Lake Arrowhead Village, 28200 Highway 189. Reserved seating is available for purchase; free open festival seating is in area behind tables. No leaving chairs in line overnight or prior to 6 a.m.; gates open to place chairs between 10 - 10:30 a.m. the morning of the concerts. Beach chairs and/or blankets are allowed in the festival seating area but not coolers. Information: (909) 337-2533, www.thelakearrowheadvillage.com or www.lakearrowheadvillage.co/events.html. CHINO HILLS - PERFORMANCES AT THE SHOPPES AT CHINO HILLS. TTT Brand (Country) from 5 - 8 p.m. The Shoppes at Chino Hills will present a variety of performances throughout the summer. All events take place at the Shoppes at Chino Hills, 13920 City Center Drive. Information: (866) 909-0305 or www.shoppesatchinohills.com. CORONA - WEEKEND MUSIC AT TOM'S FARMS. There is live music on Saturdays and Sundays from 12:30 - 5 p.m. at Tom's Farms. Check website calendar for current band line up. Tom's Farms is located at 23900 Temescal Canyon Road. Directions are available on the website. Information: (951) 277-4422 or www.tomsfarms.com. LAKE ARROWHEAD - LAKE ARROWHEAD VILLAGE SUMMER CONCERT SERIES. The Answer (Classic Rock). All performances (unless otherwise noted) take place from 6:30 - 8:30 p.m. at Lake Arrowhead Village, 28200 Highway 189. Reserved seating is available for purchase; free open festival seating is in area behind tables. No leaving chairs in line overnight or prior to 6 a.m.; gates open to place chairs between 10 - 10:30 a.m. the morning of the concerts. Beach chairs and/or blankets are allowed in the festival seating area but not coolers. Information: (909) 337-2533, www.thelakearrowheadvillage.com or www.lakearrowheadvillage.co/events.html. RIVERSIDE - RIVERSIDE PLAZA PERFORMANCES. Kaitlyn Weathers Band (Country). Performances take place from 6 - 8 p.m. on Saturdays at Riverside Plaza, 3545 Central Avenue between Riverside Avenue and DeAnza. Information: (951) 683-1066 or www.shopriversideplaza.com. P align="justify">LAKE ARROWHEAD - LAKE ARROWHEAD VILLAGE SUMMER CONCERT SERIES. Queen Nation (Queen Tribute). All performances (unless otherwise noted) take place from 6:30 - 8:30 p.m. at Lake Arrowhead Village, 28200 Highway 189. Reserved seating is available for purchase; free open festival seating is in area behind tables. No leaving chairs in line overnight or prior to 6 a.m.; gates open to place chairs between 10 - 10:30 a.m. the morning of the concerts. Beach chairs and/or blankets are allowed in the festival seating area but not coolers. Information: (909) 337-2533, www.thelakearrowheadvillage.com or www.lakearrowheadvillage.co/events.html. LAKE ARROWHEAD - LAKE ARROWHEAD VILLAGE SUMMER CONCERT SERIES. Reggae Day: Dubious Distinction from noon - 2 p.m. and Common Sense from 3 - 5 p.m. All performances (unless otherwise noted) take place from 6:30 - 8:30 p.m. at Lake Arrowhead Village, 28200 Highway 189. Reserved seating is available for purchase; free open festival seating is in area behind tables. No leaving chairs in line overnight or prior to 6 a.m.; gates open to place chairs between 10 - 10:30 a.m. the morning of the concerts. Beach chairs and/or blankets are allowed in the festival seating area but not coolers. Information: (909) 337-2533, www.thelakearrowheadvillage.com or www.lakearrowheadvillage.co/events.html. APPLE VALLEY - COURTYARD CONCERTS. Mojave Nights (Classic Rock/Variety). The Apple Valley Courtyard Concerts will take place on Thursdays from 6 - 8 p.m. at the Apple Valley Commons, Northwest corner of Dale Evans Parkway and Highway 18. Food will be available for purchase, and bring your own chair. Information: (760) 240-7000 x7071, www.applevalley.org or www.applevalleyevents.org. FONTANA - FONTANA CAR SHOW. This NON-CRUISE event takes place on the first Friday of the month from 5 - 9 p.m. (with staging from 5 - 6 p.m.) at the Fontana Civic Center, 8353 Sierra Avenue. The event includes pre-1979 classics, hot rods and muscle cars, imports and customs, low riders, specialty/exotics and motorcycles. There also will be live music, and this month's band will be Chico (Latin/Variety). Information: (909) 349-6900 or www.fontana.org, go to "Community Services" and events. LAKE ARROWHEAD - LAKE ARROWHEAD VILLAGE SUMMER CONCERT SERIES. The Neil Deal (Neil Young/CSNY Tribute). All performances (unless otherwise noted) take place from 6:30 - 8:30 p.m. at Lake Arrowhead Village, 28200 Highway 189. Reserved seating is available for purchase; free open festival seating is in area behind tables. No leaving chairs in line overnight or prior to 6 a.m.; gates open to place chairs between 10 - 10:30 a.m. the morning of the concerts. Beach chairs and/or blankets are allowed in the festival seating area but not coolers. Information: (909) 337-2533, www.thelakearrowheadvillage.com or www.lakearrowheadvillage.co/events.html. CHINO HILLS - PERFORMANCES AT THE SHOPPES AT CHINO HILLS. JB and the BC Riders (Country) from 5 - 8 p.m. The Shoppes at Chino Hills will present a variety of performances throughout the summer. All events take place at the Shoppes at Chino Hills, 13920 City Center Drive. Information: (866) 909-0305 or www.shoppesatchinohills.com. LAKE ARROWHEAD - LAKE ARROWHEAD VILLAGE SUMMER CONCERT SERIES. Uptown Funk (Bruno Mars Tribute). All performances (unless otherwise noted) take place from 6:30 - 8:30 p.m. at Lake Arrowhead Village, 28200 Highway 189. Reserved seating is available for purchase; free open festival seating is in area behind tables. No leaving chairs in line overnight or prior to 6 a.m.; gates open to place chairs between 10 - 10:30 a.m. the morning of the concerts. Beach chairs and/or blankets are allowed in the festival seating area but not coolers. Information: (909) 337-2533, www.thelakearrowheadvillage.com or www.lakearrowheadvillage.co/events.html. CHINO HILLS - PERFORMANCES AT THE SHOPPES AT CHINO HILLS. Morning Star Performing Arts (Youth) from 2 - 4:30 p.m. The Shoppes at Chino Hills will present a variety of performances throughout the summer. All events take place at the Shoppes at Chino Hills, 13920 City Center Drive. Information: (866) 909-0305 or www.shoppesatchinohills.com. RANCHO CUCAMONGA - SEPTEMBER 11 REMEMBRANCE CEREMONY. The September 11 Remembrance Ceremony will take place at 8:30 a.m. in the Freedom Courtyard at Central Park, 11200 Base Line Road. The program will include a reading of remembrance, "The Last Alarm," and an RCFD Honor Guard and Pipes and Drums Tribute. Information: (909) 477-2770, www.rcfire.org or www.cityofrc.us. APPLE VALLEY - COURTYARD CONCERTS. Ironhorse (Classic Rock). The Apple Valley Courtyard Concerts will take place on Thursdays from 6 - 8 p.m. at the Apple Valley Commons, Northwest corner of Dale Evans Parkway and Highway 18. Food will be available for purchase, and bring your own chair. Information: (760) 240-7000 x7071, www.applevalley.org or www.applevalleyevents.org. CHINO HILLS - PERFORMANCES AT THE SHOPPES AT CHINO HILLS. 80s Brigade (80s) from 5 - 8 p.m. The Shoppes at Chino Hills will present a variety of performances throughout the summer. All events take place at the Shoppes at Chino Hills, 13920 City Center Drive. Information: (866) 909-0305 or www.shoppesatchinohills.com. CHINO HILLS - PERFORMANCES AT THE SHOPPES AT CHINO HILLS. My Generation (British Invasion) from 5 - 8 p.m. The Shoppes at Chino Hills will present a variety of performances throughout the summer. All events take place at the Shoppes at Chino Hills, 13920 City Center Drive. Information: (866) 909-0305 or www.shoppesatchinohills.com. ONTARIO - ONTARIO FESTIVAL OF THE ARTS. The City of Ontario and the Chaffey Community Museum of Art will partner to present the inaugural Ontario Festival of the Arts. The event will take place from 11 a.m. - 6 p.m. in the Arts District area around 217 S. Lemon Street (near the Ontario Museum of History and Art). The day will include artist booths, art demonstrations and instruction, maker machines, displays of historical artifacts and ephemera, mini walking tours, live musical performances, food trucks and a beer and wine garden. Information: www.ontarioarts.org/festival. CHINO HILLS - PERFORMANCES AT THE SHOPPES AT CHINO HILLS. Rockstars of Tomorrow (Youth/Teen) from 1 - 3 p.m. The Shoppes at Chino Hills will present a variety of performances throughout the summer. All events take place at the Shoppes at Chino Hills, 13920 City Center Drive. Information: (866) 909-0305 or www.shoppesatchinohills.com. ONTARIO - ONTARIO/CHAFFEY COMMUNITY SHOW BAND "A Tribute to Neil Diamond." The Ontario/Chaffey Community Show Band, directed by Dr. Gabe Petrocelli, will present their first concert of the season at 7:30 p.m. The performance for the special concert will take place at the Town Square Bandshell in downtown Ontario. The bandshell is located just southeast of the Jack Mercer Bandstand (gazebo) on Euclid between "C" and "D" Streets. The show will include performances by Neil Diamond tribute artist Dean Colley/Hot August Night, The Dogs and the Ontario Chaffey Community Show Band performing a number of Neil Diamond hits. Information: (909) 226-5748, www.showband.net or www.ci.ontario.ca.us. APPLE VALLEY - COURTYARD CONCERTS. High D Boys (Folk/Comedy). The Apple Valley Courtyard Concerts will take place on Thursdays from 6 - 8 p.m. at the Apple Valley Commons, Northwest corner of Dale Evans Parkway and Highway 18. Food will be available for purchase, and bring your own chair. Information: (760) 240-7000 x7071, www.applevalley.org or www.applevalleyevents.org. ONTARIO - ROUTE '66 CRUISIN' REUNION. The Route 66 Cruise Reunion car show and festival will take place on Friday from 5 - 11 p.m. and Saturday from 9 a.m. - midnight along Euclid Avenue in downtown Ontario (between Holt and "I" Streets). There will be over 1000 classic and muscle cars on display plus live music, vendor booths, raffles, food for purchase, "Splash Dogs" shows and more. Friday performances will be local "Rockstars of Tomorrow" from 5 - 7 p.m. on the G Street Stage, and Chicago Tribute Experience (Chicago Tribute) from 6:30 - 8:30 p.m. and Bluffet (Buffet Tribute) from 9 - 11 p.m. in Ontario Town Square. Saturday performances will be Rockstars of Tomorrow from 9 a.m. - 6 p.m. on the G Street Stage, and The Alley Cats (Doo Wop) from 5 - 6 p.m., My Generation (British Invasion) from 6 - 7 p.m., Hotel California (Eagles Tribute) from 7:30 - 9:15 p.m. and Voyage (Journey Tribute) from 9:30 - 11 p.m. in Ontario Town Square. See website for full entertainment schedule. Information: (800)867-8366, www.route66cruisinreunion.com or www.ci.ontario.ca.us. CHINO HILLS - PERFORMANCES AT THE SHOPPES AT CHINO HILLS. The Fab 8 (Beatles Music) from 5 - 8 p.m. The Shoppes at Chino Hills will present a variety of performances throughout the summer. All events take place at the Shoppes at Chino Hills, 13920 City Center Drive. Information: (866) 909-0305 or www.shoppesatchinohills.com. CHINO HILLS - PERFORMANCES AT THE SHOPPES AT CHINO HILLS. World of Music (Youth) from 2 - 4:30 p.m. The Shoppes at Chino Hills will present a variety of performances throughout the summer. All events take place at the Shoppes at Chino Hills, 13920 City Center Drive. Information: (866) 909-0305 or www.shoppesatchinohills.com. REDLANDS - UNIVERSITY OF REDLANDS PERFORMANCES. Guest Artist Recital: Drew Petersen, piano. The concert will take place at 3 p.m. in Memorial Chapel. University of Redlands Music Department performances are held in the Memorial Chapel, the Frederick Loewe Performance Hall (FLPH), and/or the Casa Loma Room on the Redlands campus, 1200 E. Colton Avenue. Information: (909) 748-8700, www.redlands.edu/music or www.redlands.edu/artsatredlands. TEMECULA - WESTERN DAYS Temecula Western Days celebrates the city's heritage from a ranch town with pony rides, street vendors, entertainers and the Old Town Temecula Gunfighters high noon shoot-out. The event will take place from 10 a.m. - 3 p.m. in Town Square Park, 41000 Main Street, and Old Town Temecula. Information: (951) 694-6444, 888-TEMECULA or www.temeculaca.gov. APPLE VALLEY - COURTYARD CONCERTS. Caliente (Top 40/Standards). The Apple Valley Courtyard Concerts will take place on Thursdays from 6 - 8 p.m. at the Apple Valley Commons, Northwest corner of Dale Evans Parkway and Highway 18. Food will be available for purchase, and bring your own chair. Information: (760) 240-7000 x7071, www.applevalley.org or www.applevalleyevents.org. RANCHO CUCAMONGA - HISPANIC HERITAGE NIGHT. The Rancho Cucamonga Hispanic Heritage celebration program will take place from 7 - 9 p.m. at the Paul A. Biane Library at Victoria Gardens, 12505 Cultural Center Drive. The program will include musical performances, crafts, cultural activities and more. Admission is free, but free tickets are required and will be available in advance at both Rancho Cucamonga libraries. Information: (909) 477-2720 x3907, www.cityofrc.us/cityhall/lib/biane/default.asp or www.cityofrc.us. SAN BERNARDINO - CALIFORNIA NATIVE AMERICAN DAY CELEBRATION. The California Native American Day Celebration will take place from 6 - 9 p.m. at California State University San Bernardino, 5500 University Parkway. The celebration of California Indian culture, heritage and family is open to the public and will include traditional bird songs, music, art and Native American food vendors. Bring lawn chairs or blankets for outdoor seating. Information: (909) 537-7204 or www.nativeamericanday.org. CHINO HILLS - PERFORMANCES AT THE SHOPPES AT CHINO HILLS. Living Cover (Covers) from 5 - 8 p.m. The Shoppes at Chino Hills will present a variety of performances throughout the summer. All events take place at the Shoppes at Chino Hills, 13920 City Center Drive. Information: (866) 909-0305 or www.shoppesatchinohills.com. To return to the all cities by date page, click here.